My favorite place to stay in Los Angeles, California is at The Beverly Hills Hotel with their world-famous restaurant, The Polo Lounge. 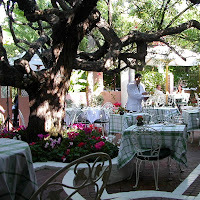 The Polo Lounge is open from 7 AM - 1:30 AM and serves breakfast, lunch, dinner, and late-night suppers. They also have both outdoor and indoor seating. If you dine during lunch and dinner in the summer you will get to enjoy a piano accompaniment alternating with light jazz on the patio. During Sunday Brunch, jazz music is also featured. Their menus have an extensive range of options for those on a gluten free diet including fresh squeezed juices, smoothies, fruits, berries, eggs, omelettes, fish, caviar, soup, salads, risotto, meats, poultry, etc. They have such a range of fresh ingredients and are more than willing to create any dish you could imagine. It's even better to know that they are very aware of Celiac Disease and the dangers of cross-contamination. They also told me the last time I stayed there that if I were to let them know in advance about my gluten free diet they would get the proper ingredients to prepare gluten free breads, waffles, and pancakes for me! So, keep that in mind when booking a reservation!